The Committee for Attorney Recruitment, Development & Diversity (CARDD) has continued its efforts to expand our diversity and inclusion initiatives inside and outside of the Firm. 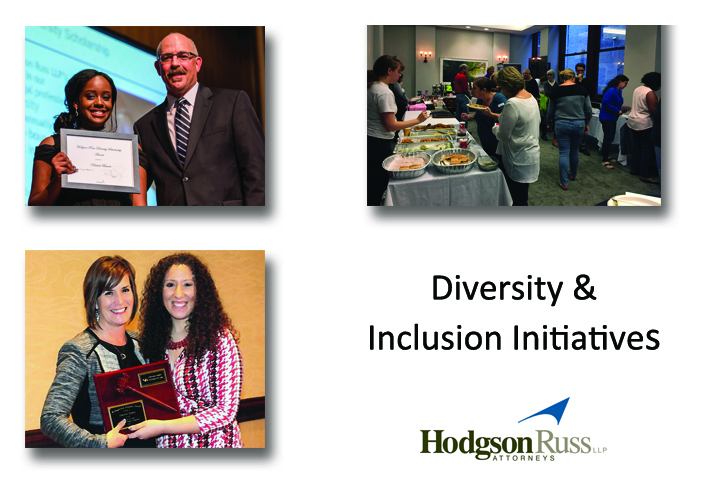 In October 2016, CARDD brought Dr. Arin Reeves to Hodgson Russ for two days of keynote addresses and small group workshops focused on building a diverse and inclusive workplace. Joe Brown, Hodgson's Diversity Partner, built upon Dr. Arin Reeves’s work in with “inclusive intelligence” tips and events. Joe challenged us to embrace gratitude, disrupt our guts, and to say “and” instead of “but.” In April 2016, CARDD hosted a lunch discussion about ways we might implement some of these tips in our work and personal lives. In 2017, Hodgson Russ awarded our 5th Diversity Scholarship to Khaliah Beaver. Hodgson Russ's Diversity Scholarship supports a college-bound high school student from Buffalo Prep, who is interested in a legal career. In June 2017, students in the UB Law Scholars Program visited our Buffalo Office to practice their networking skills and build their mentoring network. UB Law Scholars students participate in an intensive law school preparation program for college students which includes law school classes and living on campus at UB. JodyAnn Galvin received the "Distinguished Alumna Award" from UB Law Students of Color. In January 2018, it was announced Sujata Yalamanchili would receive a "2018 NFJC Community Leader Award” from the National Federation for Just Communities of WNY. Joe Brown was elected as President of the Minority Bar Foundation, effective 1/1/18. We provided financial support and leadership to dozens of organizations that support diversity and inclusion, or that support diverse populations. During 2018, we will only continue to rise as a leader in celebrating diversity within the community and continue to provide financial support and leadership to dozens of organizations which support diversity and inclusion, or that support diverse populations.